Left: Painting of Joseph Tillinghast (1734-1816). This is the Joseph Tillinghast that burned the Gaspee, out of the four Captains Joseph Tillinghast living in the area at the time (see discussion below). The source of the name of Joseph Tillinghast comes from the account of the 1772 attack given by John Mawney in 1826 in the American and Gazette. Mawney relates that he was living with Tillinghast at the time, and that it was Tillinghast who commanded the particular longboat that carried Mawney on the raid. The Tillinghasts were a prominent family in Rhode Island at the time preceding the Revolution. Thomas Tillinghast was a Colonial Deputy (State Representative) from West Greenwich, and Nicholas Tillinghast helped Governor Stephen Hopkins redress grievances to the King against the Stamp Act in 1764. The Tillinghast farm was noted by Blaskowitz in constructing his Rhode Island map of 1771. We now pretty much have settled on the last listed Capt. Joseph Tillinghast is our man, based on the ample evidence presented below . PV001 is the Providence's Old North Burial Ground where many Gaspee raiders have been buried. For further information on the three or four Joseph Tillinghasts, we will recommend Tillinghast, Wayne G. The Tillinghasts in America: The First Four Generations. RI Genealogical Society, 2006, p282-299. So as to avoid confusion in the reader, we will henceforth refer to Wayne Tillinghast, the genealogical researcher as "WT". Any of the four Captains Joseph Tillinghast above could have been in Rhode Island at the time of the attack in 1772; and have been a source of great uncertainty to historians and genealogists previous to this new book by WT. . Joseph Tillinghast (1734-1816) (son of John) was born in East Greenwich, but is not recorded as being buried there. He was raised in a large, extended family, and his mother died when he was four. While he was born into a family of farmers, Joseph removed early to Providence and pursued the maritime business as did his half-brother, Allin Brown. According to WT, this Captain Joseph Tillinghast worked in partnership with Josiah (or Joshua) Hacker in operating the Providence to Newport ferry packet in 1762. This is of intense interest to us because in 1763, Joseph Tillinghast was replaced in this partnership by none other than Benjamin Lindsay, the captain of the Hannah that lured the Gaspee aground in June of 1772. Joseph Tillinghast was a sea captain and merchant based in Providence, and primarily shipped goods between Rhode Island and St. Croix in the present US Virgin Islands. He often carried molasses and rum on his return voyages, and frequently sailed for the Nicholas Brown & Company and later for Brown, Benson, & Ives, both of which one partner was Gaspee raid commander John Brown. He was likely bow-legged, as he was referred to in various Providence records as "Bandy" and "Leggs". He married a Mary "Polly" Earle (1753-1797) from Providence in 1776. This man had a child named William Earle Tillinghast (c1777/8 - 25 APR 1817) who married an Amey Mawney, daughter of Pardon Mawney, John Mawney's brother. And since the Tillinghast-Earle marriage did not take place until 1776, this Joseph Tillinghast would've been free to bach with his cousin John Mawney in 1772 at the time of the Gaspee attack. All are referenced by our old friend Weldon Whipple at www.whipple.org and by his source, Stanley W. Arnold, Jr., "A Mawney Line of Descent," Rhode Island Genealogical Register, v. 11 (1988), p. 206.b This Joseph Tillinghast's great-grandfather was also the original immigrant Pardon Tillinghast from the 17th Century. This Captain Joseph Tillinghast was also a second cousin to Gaspee raiders John and Joseph Brown. WT, drawing on family documents, agrees that this Captain Joseph Tillinghast (1734-1816) was the one involved in the burning of the Gaspee. According to the Descendants of #01 Francis Sprague website, Mary Earle Tillinghast's father was William Earle (1727-1804) and her mother was Mary Brown (1733-1800) whose father was George Brown. This Joseph and Mary Earle Tillinghast had a house in Providence, and had nine children in all. We could also expect that George Brown was born c1700-1713 and according to Ancestry.com, Mary Brown's father was born in Dover, England then moved to Providence. 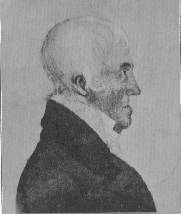 It is highly likely, therefore, that George Brown, Esq (1703-1786), one of the witnesses to the meeting to plan the destruction of the Gaspee, and who later gave obviously false testimony at the inquiry surrounding that event, was also the grandfather in law to Gaspee raider Joseph Tillinghast. During the Revolution, Joseph Tillinghast did not serve in the active military in a formal capacity. In 1776 he was part owner, along with fellow Gaspee raider John B. Hopkins et al, of the privateering sloop Yankee Raider. In 1777 he is known to have been master aboard John Brown's privateering sloop, Polly, and was engaged in blockade running, but his time at sea in these venures was short. In 1777 he is noted to have moved to the rural suburb of Smithfield, RI where his first child was born. WT surmises that his move to Smithfield was to escape the impending occupation of Providence by the British. Commodore Esek Hopkins was known to have bemoaned that, "the princable men that have maid fortens by Priviteren, have bought estates back in the Cuntry & have and are now moving away which must leave the town in a Defencless Condition." Nonetheless, in 1778 Joseph Tillinghast next bought a 100 acre farm in the adjoining rural town of Cumberland, RI and lived with his family there until after the Revolution. There, he was elected to the town council. In 1779 he enlisted his black slave, Limbrick, into the Rhode Island Regiment with the condition that Tillinghast himself would be exempted from such service. 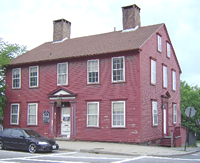 Left: Tillinghast house, 403 South Main Street, built c1770. Side note: According to Florence Parker Simister, in Streets of the City--An Anecdotal History of Providence, p35 there was a Captain Joseph Tillinghast who ran a packet ship between Providence and Newport, and who married a Rebecca, daughter of Nicholas Power. We feel Simister is erroneous in her assignement of this Joseph Tillinghast (the son of John) to the marriage with Rebecca Power. Miss Simister was an historian of note, but we have documented below that the Joseph Tillinghast that married Rebecca Power, the daughter of Nicholas Power, was not born until 1790, and is therefore excluded as possibly being a Gaspee raider. It is more likely that various attributes of all four Captain Joseph Tillinghasts have been so intermingled that one might easily become confused. 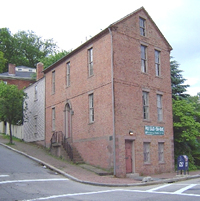 Right: The Tillinghast building at 12 James Street at intersection with South Main Street built c1795. This building has undergone extensive award-winning restoration and is now a two bedroom home, featured as the RI House of the Week by the Providence Journal in December 2008. As the Revolution wound down, Tillinghast returned his family to Providence on land he had previously purchased on what now includes 400 and 403 South Main Street, both still extant, and immediately adjacent to the Pardon Tillinghast family lands to the south. By 1783 Joseph Tillinghast returned to the sea, sailing John Brown's sloop Polly on trade routes to the Carribbean. Eventually Tillinghast along with his son, William Earle Tillinghast, and Benjamin E. Gorton,.formed a shipping firm of Tillinghast, Gorton, & Tillinghast. Sometime in 1794 he encountered a severe winter storm at sea and suffered frostbite to his feet. He never sailed again, but his maritime interests continued. He owned two wharves on South Main Street, and advertised in 1801 the sale of rum, sugar, and rock salt imported from St. Croix. Capt. Joseph Tillinghast, Jr. (1788-1815) never married, engaged in the business of graving referring to the application of protective coatings of tar onto the hull of a ship. From USGenWeb Rhode Island files we discover that the 1790 Providence census lists only one Joseph Tillinghast as 1-4-4-*-*; that is, 1 male over 16 (himself), 4 males under 16 (sons), and 4 females (wife, daughters, and mothers-in-law). There were no other freepersons or slaves in the household. We cannot be sure if this the same Joseph Tillinghast of our interest however. On the other hand, the census count is a close match with what we know about Joseph and Mary Earle Tillinghast's household. They had nine children, six of whom were male, but two sons died prior to the 1790 count at which time, all survivors would've been less than 16 years old, leaving a match at 4. There were 3 daughters, but only two were born by 1790. Add one for the wife, and assume one for the mother-in-law, and you have a match at 4 females. There are no RevWar pension applications on file for any Joseph Tillinghast at HeritageQuest. He was a member of the Masons, the Providence Library, and of the Charitable Baptist Society. In April 1819 the remainder of his estate was sold at auction, consisting of "Two valuable Lots of Land, at the corner of Benefit and Transit streets, and Four Lots of land on Benevolent street, all of which are pleasant building lots; they being part of the real estate of the late Capt. Joseph Tillinghast, deceased." After weighing all the evidence, it appears most certain that the Captain Joseph Tillinghast that took part in the attack on the Gaspee was the one born in East Greenwich, RI on 1734, died in 1816, and is buried in the Old North Burial Ground in Providence, as are many of his fellow Gaspee raiders including his friends John Mawney and Joseph Bucklin. In recognition of his actions in attacking the HMS Gaspee, the Gaspee Days Committee recognizes Captain Joseph (Son of John) Tillinghast as a true American patriot.